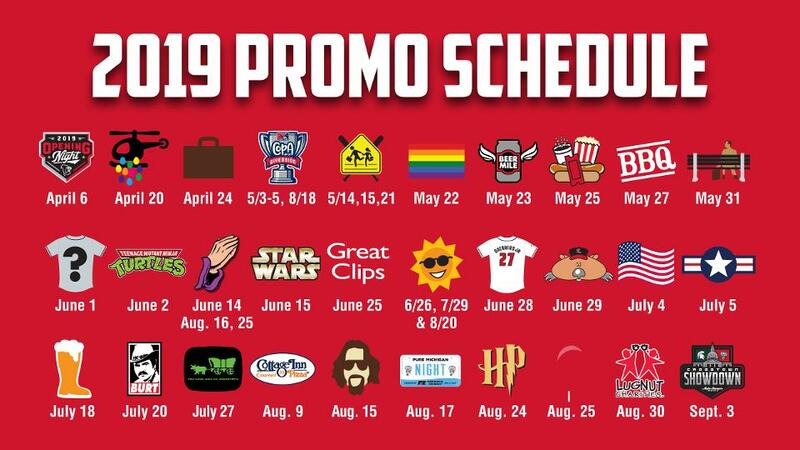 LANSING, Mich. - The Lansing Lugnuts officially released their 2019 Promotional Schedule, headlined by the return of the Golden Bobblehead award-winning Backyard Baseball Night, and joined by all new, exciting theme nights, such as Oregon Trail Night, plus giveaways, fan-favorite promotions and more! The Lugnuts' 24th Midwest League home opener arrives on Saturday, April 6th, with an Opening Night Block Party, including a winter hat giveaway presented by Auto-Owners Insurance and the first of 19 postgame LAFCU Fireworks Spectaculars! Then in the heat of the summer, the 4th of July celebration will have double the fireworks, the Lugnuts' LAFCU Fireworks plus the City of Lansing's Fireworks, perfectly paired with a classic night at the ballpark. Nothing is more American than baseball, hot dogs and fireworks on the 4th of July! And the regular season concludes with one of the community's greatest baseball traditions: the 13th Annual Crosstown Showdown presented by Auto-Owners Insurance, with the Lugnuts taking on the Michigan State Spartans in the battle of Lansing vs. East Lansing! Cowabunga! Join Raphael, Leonardo, Michelangelo and Donatello on June 2 as the Rise of the Teenage Mutant Ninja Turtles invades the stadium. Join us on July 20 as the Lansing Lugnuts will be honoring Lansing's native son with specialty team jerseys, a bobblehead giveaway presented by WILX and more. Our tribute to Burt Reynolds will be one that you won't want to miss. Back by popular demand! Backyard Baseball Night 2 will return June 29 to Cooley Law School Stadium. This time, the fans get to pick who will be the bobblehead giveaway between Stephanie Morgan, Achmed Khan, Pete Wheeler and Kenny Kawaguchi, powered by MI Student Aid. We will have everything you need once you make the journey to Cooley Law School Stadium, but be careful crossing the Grand River. July 27 will be Oregon Trail Night with a Daniel Norris Colonial Bobblehead giveaway! The magic is back at Cooley Law School Stadium on August 24. Join Harry, Ron and Hermione as the stadium is transformed with Witchcraft and Wizardry. Enjoy a butterbeer, Quidditch, photo-ops, trivia and more! PLUS, we have a SECRET giveaway for the first 1,000 fans. Live music, authentic food and more will be at our Cinco de Mayo Festival Street Festival. Continuing our Copa de la Diversion weekend, the festivities will make its way into the game, where the team will be changing our name for the weekend. - 1 hot dogs, Miller High Life cans, Fountain Drink (16 oz), Popcorn & Ice Cream Sandwiches. - $2 tacos all day or night! - Bring your dog to the ballpark and enjoy some baseball. - $1 Draft Beer (12 oz), $2 Draft Beer (16 oz), $3 Draft Beer (24 oz) and $3 Wine. Mondays - Dollar Deal Day: $1 hot dogs, Miller High Life cans, Fountain Drink (16 oz), Popcorn & Ice Cream Sandwiches. Tuesdays - Taco Tuesday: $2 Tacos. Wednesdays - Dog Days of Summer: Bring your dog to the ballpark every Wednesday! Thursdays - Labatt Thirsty Thursdays: $1 Draft Beer (12 oz), $2 Draft Beer (16 oz), $3 Draft Beer (24 oz), $3 Wine. Sundays - Delta Dental Kids Day: Pregame Play Catch on the Field, Postgame Kids Run the Bases, Player Autographs. For the latest information, call (517) 485-4500 or visit lansinglugnuts.com.